Many people spend the majority of their time during the workday with their co-workers, and there may be situations when the typical eight-hour workdays end with an office happy hour, dinner, or other social engagement with co-workers outside of the office. Given the time spent together, it’s possible that the people you share an office with can become more than just co-workers. These relationships formed through work can have a major impact on how satisfied people are in the workplace. They can also affect how comfortable employees feel coming into the office each morning, how productive they are throughout the day, and how happy they are in their chosen career. Paychex took a closer look at this topic by surveying 1,011 full-time workers. We found out how their workplace relationships affected their office environments and their day-to-day duties. We also surveyed managers and HR professionals about how friendships influence their offices. Business + friendship = A winning pair? Overall, our survey found that baby boomers had the most work friends, and men of this generation had an average of 6.3 friends. This generation has a reputation for being very committed to their work and often staying with the same employer throughout their career, increasing their chances of fostering genuine, lasting friendships. On the other hand, millennial women tended to have the fewest workplace friendships, just 3.5 on average. This could be due in part to having shorter tenures in the workplace compared to baby boomers. When it came to job roles, those in management roles tended to have more work friends than others - especially those in roles that could be more transient, such as consultants and temporary workers. Managers sometimes have more tenure in companies than lower-level workers, and may have had more time to build rapport with their colleagues. While those who were satisfied with their work had 4.3 friends on average, those who were dissatisfied with their work weren’t far behind with 3.3 friends. Bonding can happen while venting about an assignment, a colleague, or the company. Whether workers are forming friendships through shared satisfaction or dissatisfaction, there is a mutual interest that can draw them together. Those who had no feeling, good or bad, about their job had the least amount of work friends. An ideal work environment is a place of collaboration, cooperation, and working together as a team, which could explain why workers who were most comfortable asking for help and advice from their colleagues had the most work friends. Cultivating friendships in the workplace can allow for more collaborative efforts, which could, in turn, increase employee satisfaction, dedication, and attention to tasks. Sometimes when there are several workplace friendships, there may be a potential for both increased collaboration, but also possible distractions. Interestingly, we found those who brought extra work home more frequently tended to have more work friends. This could indicate that people with a greater number of friends at work are more willing to put in extra hours to get the job done. It could also mean they’re not getting work done during normal business hours, assuming that the potential is that being surrounded by friends in the workplace, the day could turn into hours of office gossip and personal conversations, unnecessarily long walks to various parts of the office, and possibly even prolonged lunch breaks. Chatter among friends can cut into the number of hours available for productivity throughout the workday. We found that workers who brought work home four nights a week had an average of 5.8 friends. Friendships at work certainly do have their benefits, but this breach between personal and professional lives also has the potential to cause distraction. Given the amount of time spent with certain co-workers, it's easy to see how conversations about work responsibilities and stresses could evolve into discussions of private and personal matters. However, the depth of personal information people chose to confide in their colleagues varied across generations and industries. Three industries had over one-third of survey respondents express high levels of comfort discussing personal matters around the company coffee machine. Arts, entertainment, and recreation workers led the list at 36.4 percent feeling mostly or completely comfortable, with finance and insurance (34.6 percent) and education (34 percent) close behind. 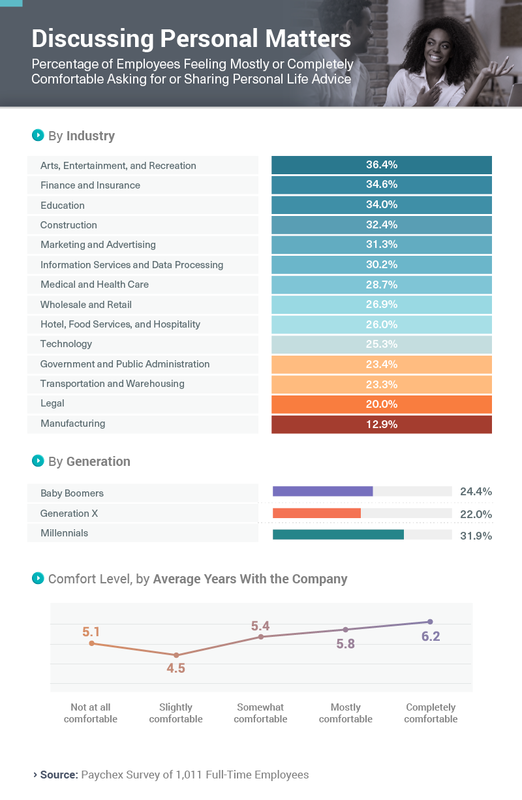 Other industries such as construction, marketing and advertising, information services, and the hospitality sector reported percentages of 25 percent or more in terms of high comfort levels. If you work in the legal or manufacturing industries, however, you may be less likely to hear more sensitive personal subjects being discussed around the office. Generation may also influence how comfortable people are in giving or receiving personal advice in the workplace. Nearly a third of millennials (31.9 percent) felt completely or mostly comfortable chitchatting about such issues, with Gen Xers expressing the least amount of comfort: Only 22 percent felt at ease in more personal conversations. Tenure with a company also appeared to play a role, with those averaging just over six years feeling the most comfortable seeking personal advice at work. Millennials may be the best at limiting their socializing while on the clock: Compared to other generations surveyed, they were the least likely to discuss non work-related topics with work friends. You won't find this group of workers chit-chatting over turkey sandwiches either. Millennials were also the least likely to eat lunch with their colleagues. Of course, this could also be because millennial workers could be newer to the workforce, and their employers may limit them to set break times, or limit the amount of time they spend on breaks. On the flip side, millennials were the most likely to go to happy hour or hit the gym with their work friends. Millennials are often comfortable bouncing from activity to activity; they are highly curious and love the variety at work. This suggests that millennials may have the ability to keep their office atmosphere strictly work-related, yet may maintain healthy friendships with their co-workers outside of the office. It could also mean that millennials may simply have more free time outside of work to get together with friends from the office or elsewhere. People working in management or human resources said friendships in the workplace had a positive effect on their workers. Nearly 71 percent said workplace friendships were positive, and only 4 percent said they had a negative impact. Over 25 percent said they had no impact. One mid-level manager of a manufacturing company who we surveyed felt friendships made companies stronger. “People who are friends are always willing to go the extra mile to help out even if the task is outside of their job description,” this 47-year-old employee said. “Caring for each other has equaled caring for the company.” When employees care for their company, it gives their work meaning and increases the chances of them striving to do their best work possible. On the other hand, some managers in our study felt that friendships did little to improve their workplaces, and in some cases, made the workplace worse. “I think it’s better for things to remain professional at work,” a mid-level real estate manager told us. “Friendships can sometimes create drama.” Some theories suggest that when relationships have more than one goal, such as between colleagues who are also friends, these goals can start to compete and conflict with one another. This balance becomes even more difficult to maintain when one friend gets promoted above the other; in that situation, clear communication and boundary-setting are key to relationship success. Overall, we found that workplace friendships did have an impact on employees’ happiness, work ethic, and job satisfaction. Workers can often benefit from getting to know their colleagues on a personal level — not only to make their work experience a more positive one overall, but also to increase team cohesion. One key factor in strengthening relationships between your employees is making sure there are thorough workplace policies in place, and reviewing them periodically. Paychex can help you streamline this process by working with you to create and distribute your own employee handbook. Whether you have one employee or a team of 1,000, Paychex can help you with your human resources needs. We can provide dedicated HR professionals to help you navigate even the most complex dynamics between your workers, freeing you up to focus on keeping more of your time, money, and talent. To learn more, visit us at Paychex.com. For this study, we surveyed full-time employees who do most of their work in a location other than their home, which is shared with employees from the same company (like an office). To perform the survey, we used Amazon’s Mechanical Turk. In all, we had 1,011 participants who were between 19 and 75 years old. On average, they were 36.2 years old. The standard deviation for age was 10.2. 46.7 percent of survey participants were women, 53 percent were men, and 0.3 percent were nonbinary. In total, 201 participants were HR professionals or managers. Industries and job roles with a sample size less than 26 were not shown in our tables and charts. Outliers greater than three times the standard deviation plus the mean were excluded from numerical responses. All of the information reported in our analysis was dependent on self-reported data, which means there are inherent issues, including the potential for exaggeration, forgetfulness, minimization, and more. Additionally, none of our findings have been weighted or statistically tested. Scaling your business requires that you take time to assess the current state of the business, plan for where you want to go, and implement process improvements. Read on to learn how HR managers can understand business needs and adapt. Many business owners have had to face an IRS audit, and most were terrified at the mere possibility. However, an understanding of the process and some preparation tips can help alleviate some of the fear.